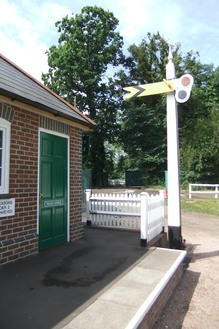 The Ticket Office is located in the right-hand end of the Station Building, next to the large signal post. The Green Route is a continuous journey around the railway, travelling to the far ends of the network over the Jubilee and Millennium lines. The Red Route stops at Cockcrow Hill Station, the engine changes ends and the train returns to Hardwick via the Spur and Jungle lines. Both routes are about 1 ¼ miles in length and journeys take about 15 – 20 minutes. Click HERE to see a map of the two routes. 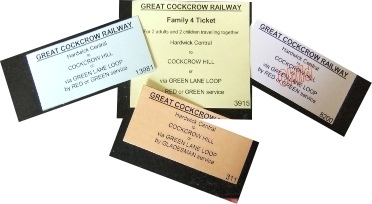 There is a range of tickets to suit your needs. You can buy tickets for single journeys or, if you would like to try both routes, you can buy a double ticket , thus saving you money! Please note that you will need to queue again for the second ride. In addition you can purchase family-of-four tickets (2 adults and 2 children or 1 adult and 3 children) for single or double rides. Double and Family tickets always work out cheaper than buying single tickets. We can accept most Credit and D ebit cards. Contactless Payment and Apple Pay are available.